It seems when we think of natural disasters and property damage, most people think of hurricanes and coastal areas which would be true and would certainly not apply to Missouri however, Missouri has threats to property from natural disasters as well. In fact, according to RealtyTrac’s annual U.S. Natural Disaster Housing Risk Report, while Missouri does not have any counties that fall in the “Very High Risk” category when it comes to risk to housing from natural disasters, Missouri does have three counties that are in the “High Risk” category two of which, Jasper and Newton, are in the Joplin area in the southwest portion of the state and the third, Madison, is in the southeast area of Missouri. In assessing the risk of property damage from natural disaster to counties, RealtyTrac looked at five natural disasters that pose a risk to housing: earthquake risk, hurricane risk, tornado risk, flood risk and wildfire risk. 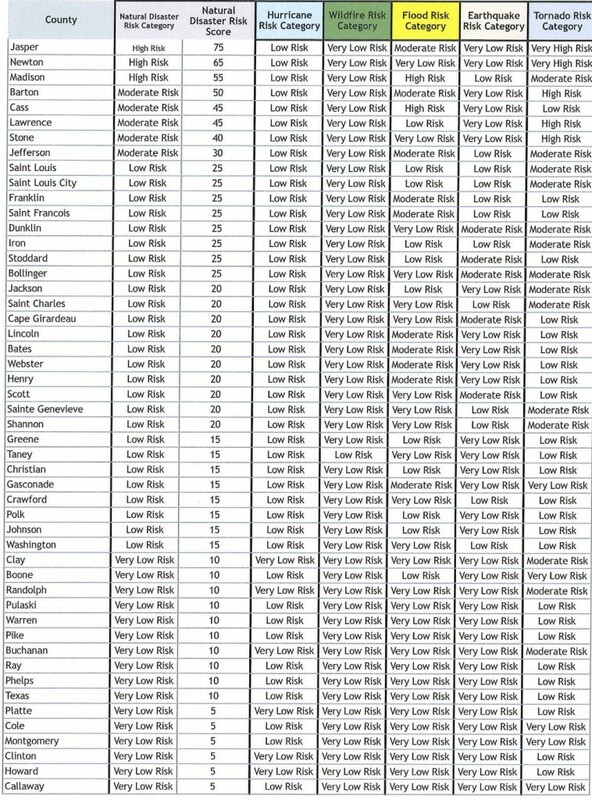 As the table below shows, risk of hurricanes and wildfires is pretty low in Missouri but we definitely have the other three threats here to varying degrees. In the St Louis area, Jefferson County scored in the “Moderate Risk” category but the remaining counties in the “Low Risk” category. What is the risk of flood for your home?